This blog post by the Operations Room, one of my favourite operations blogs, reminded me that I should write about the Argentine pizza chain, Ugi's. Its pizza was pretty good, but I was more fascinated by its operation of the stores and the business model, while visiting Buenos Aires (BA). They sold one pizza. Exactly one type: mozzarella on tomato sauce on pizza dough. The whole pizza. Or by the slice. You can add condiments like chilli peppers and oregano, after you get the pizza, for free. The cardboard box is extra. Basic and bare. No frills. There is basically standing room only with very few seats and tables in the shops. Most people do take out. The result: Very popular! Probably the longest queue for food in BA. Each shop had a big oven and 2 guys making the pizzas. That seems to be it. 1. Work the dough and spin it out to lay onto a wooden pizza pan. 2. Ladle the tomato sauce from a big pot onto the dough, and smooth it over the dough with a circular smudge with the bottom of the ladle. 4. Put the pizza into the oven. 5. Check on the other pizzas in the oven. Take them out onto the table when ready. 7. Box it. Or put a slice on a plate. 8. Hand it to the customer. I could have stared at the guy making pizzas for hours. It was so well practiced and smooth, since it's the only thing he makes all day long, by the hundreds, every day. It reminded me of some of the best run factories I've visited before. Precise. Lean and Mean. The simple business model makes it possible. Do you find yourself asking, "Given their popularity, why don't they add 1 or 2 more flavours, like pepperoni or something?" or...why should they change anything? I think for one, it would trade off speed with variety. Secondly, they are already maxing out their capacity, so why add more. There's unlikely more revenue to be had, and I can't comment on profitability. Thirdly, given their popularity, why should they change any of it? The customers clearly like it the way it is. You can read more about Ugi's here. As much as I love the parrilladas Argentinas, do have a Ugi's pizza next time you're in BA! Timberland customer care & operations - I approve! Buying a brand is buying quality - that's especially true for outdoor equipment. With this belief, I purchased a pair of Timberland hiking boots that said "Waterproof" on a piece of official-looking metal attached to them. I then ended up with wet feet during an 8-day trek in Patagonia where it often rains - that sucked. With my toes literally swimming in water within the boots, after a soppy wet day of a 19km hike, I was not a happy camper. However, my perception of Timberland took an 180 degree turn for the better. Having bought the boots in southern Chile in a Bata store, having used them extensively and been disappointed and upset by them, I ran into a Timberland brand store 2,500km away from where I bought them, still in Chile. I went and complained about my disappointment in these supposedly "waterproof" boots, and I was offered the chance to exchange them for a brand new pair that is indeed waterproof, paying only the small price difference between the two pairs. I bought them in Bata, which is a popular international brand that happens to carry the Timberland boots. However, I was able to exchange them in a Timberland own brand store. Given the receipts I got from the Timberland store says "Bata" on it, I suspect the two are operated by the same company. However, as a western audience, can you imagine buying something in Gap and then returning in Banana Republic (same mother company)? I don't know how it's like in the US, but in Canada, returns and exchanges wouldn't be possible cross provincial borders. Yet, in this case, it was not a problem. It was at least 3 weeks after the original purchase date, while the receipt stated a 14-day exchange period. I also didn't keep the paper receipt (trying to be light while travelling), but I had a photo of it on my phone. This I was able to email to them to enable the processing. Again, can you imagine this to happen in a western country? Finally, for everyone's learning, apparently, if it only says "waterproof", it's not waterproof. Only if it says "Gore-Tex", then it's actually waterprof. I went into the Timberland store only to vent my frustration. I was positively flabbergasted when they offered to exchange for a new pair. Not only is the customer care commendable, but operationally that this could happen is something I would never have expected. They basically went against all the rules I know that would make this infeasible in western countries. Yet, the teens that worked at the Timberland store were willing enough to find ways to help me, a foreigner with broken Spanish, so I would have this outstanding experience and be happy with the decently expensive pair of hiking boots. How they keep the books straight on this transaction is beyond me, 'cause surely they are running Bata and Timberland as two separate business entities. The result: Timberland now has a new loyal customer. This is an outstanding example of great customer care made possible by some well-integrated and smooth operations. Simulation is a powerful tool in the hands of Operations Research practitioners. In this article I intend to demonstrate the usage of a discrete event process simulation, extending on the bottleneck analysis I wrote about previously. A few days ago I wrote an article demonstrating how you could use bottle neck analysis to compare two different configurations of the security screening process at London Gatwick Airport. Bottleneck analysis is a simple process analysis tool that sits in the toolbox of Operations Research practitioners. I showed that a resource-pooled, queue-merged process might screen as many as 20% more passengers per hour and that the poor as-is configuration was probably costing the system something like 10% of its potential capacity. The previous article would be good to read before continuing, but to summarize briefly: Security screening happens in two steps, beginning with a check of the passenger's boarding pass followed by the x-ray machines. Four people checking boarding passes and 6 teams working x-ray machines were organized into 4 sub-systems with a checker in each system and one or two x-ray teams. The imbalance in each system was forcing a resource to be under utilised, and Dawen quite rightly pointed out that by joining the entire system together as a whole such that all 6 x-ray machines effectively served a queue fed by all 4 checkers, a more efficient result could be achieved. We will look at these two key scenarios, comparing the As-Is system with the What-If system. The bottleneck analysis was able to quantify the capacity that is being lost due to this inefficiency, but as I alluded, this was not the entire story. Another big impact of this is on passenger experience. That is, time spent waiting in queues in the system. 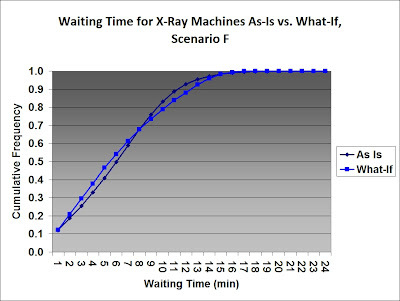 In order to study queuing times, we turn to another Operations Research tool: Simulation, specifically Process-Driven Discrete Event Simulation. Note: There may be an opportunity to apply Queuing Theory, another Operations Research discipline, but we won't be doing that here today. Discrete Event Simulation is a computer simulation paradigm where a model is made of the real world process and the key focus is the entities (passengers) and resources (boarding pass checkers and x-ray teams) in the system. The focus is on discrete, indivisible things like people and machines. "Event" because the driving mechanism of the model is a list of events that are processed in chronological order, events that typically spawn new events to be scheduled. 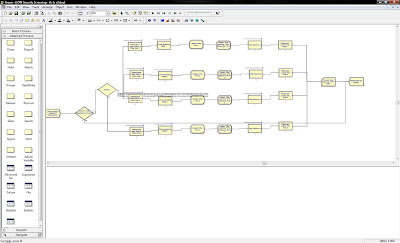 An alternative driving mechanism is with set timesteps as in system dynamics, continuous simulations. Using a DES model allows you to go beyond the simple mathematics of bottleneck analysis. By explicitly tracking individual passengers as they go through the process, important statistics can be collected like utilisation rates and waiting times. 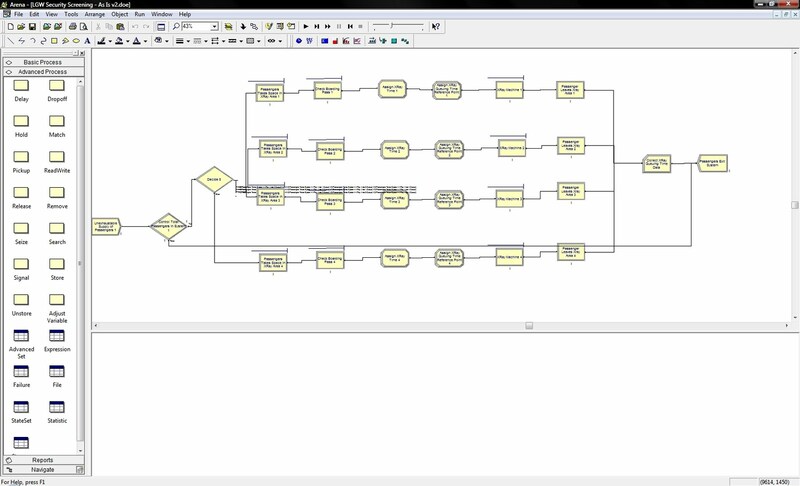 During my masters degree, the simulation tool at the heart of our simulation courses was Arena from Rockwell Automation, so I tend to go to it without even thinking. I have previously used Arena in my work for Vancouver Coastal Health, simulating Ultrasound departments and there are plenty of others associated with the Sauder School of Business using Arena. Example. Example. Arena is an excellent tool and I've used it here for this artilce. I hope to test other products on this same problem in the future and publish a comparison. In the Arena GUI you put logical blocks together to build the simulation in the same way that you might build a process map. Intuitively, at the high level, an Arena simulation reads like a process map when in actuality the blocks are building SIMAN code that does the heavy lifting for you. Passengers decide to go through screening on the left, select the boarding pass checker with the shortest queue, are checked, proceed to the dedicated x-ray team(s) and eventually all end up in the departures hall. 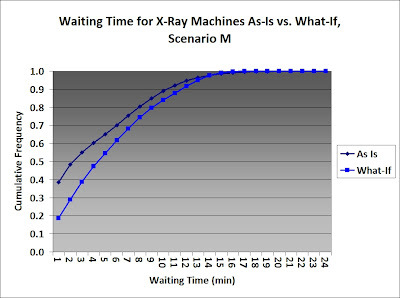 An X-Ray team is assumed to take a minute on average to screen each passenger. This is very different from taking exactly a minute to screen each passenger. Stochastic (random) processing times are an import source of dynamic complexity in queuing systems and without modelling that randomness you can make totally wrong conclusions. For our purposes we have assumed an exponentially distributed processing time with a mean of 1 minute. In practice we would grab our stop-watches and collect the data, but we would probably get arrested for doing that as an outsider. Suffice it to say that this is a very reasonable assumption and that exponential distributions are often used to express service times. As in the previous article, we were uncertain as to the relationship between throughput of boarding pass checkers and throughput of x-ray teams. We will consider three possibilities where processing time for the boarding pass checker is exponentially distributed with an average of: 60 seconds (S-slow), 40 seconds (M-medium), 30 seconds (F-fast) (These are alpha = 1, 1.5 and 2 from the previous article). 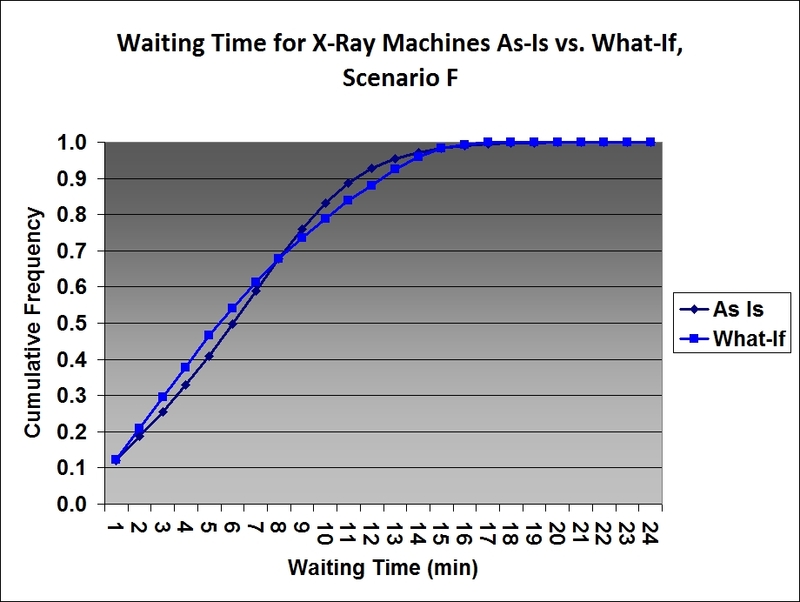 In the fast F scenario, our bottleneck analysis says there should be no increased throughput What-If vs. As-Is because all x-ray machines are fully utilised in the As-Is system. In the slow S scenario there would similarly be no throughput benefit because all boarding pass checkers would be fully utilised in the As-Is system. Thus the medium M scenario is our focus, but our analysis may reveal some interesting results for F and S.
We're focused here on system resources and configuration and how they determine throughput, but we can't forget about passenger arrivals. The number of passengers actually requiring screening is the most significant limitation on the throughput of the system. I fed the system with six passengers per minute, the capacity of the x-ray teams. This ensured both that the x-ray teams had the potential to be 100% utilised and that they were never overwhelmed. This ensured comparability of x-ray queuing time. I ran 28 (four weeks) replications of the simulation and let each replication run for 16 hours (working day). We need to run the simulation many times because of the stochastic element. Since the events are random, a different set of random outcomes will lead to a different result, so we must run many replications to study the possible results. Also note that I implemented a rule in the as-is system, that if more than 10 passengers were waiting for an x-ray team the boarding pass checker would stop processing passengers for them. First let's look at throughput. On average, over 16 hours the what-if system screened 18.9% more passengers than as-is. The statistics in the table are important. Stochastic simulations don't given a single, simple answer, but rather a range of possibilities described statistically. The average for 4 weeks is given in the table, but we can't be certain that would be the average over an entire year. The half width tell us our 90% confidence range. The actual average is probably between one half-width below the average and one above. Note: I would like to point out that this is almost exactly the result predicted analytically with the bottleneck analysis. We predicted that in this case the system was running at 83.3% capacity and here we show As-Is throughput is 4728.43/5621.57 of What-If throughput = 84.1%. The small discrepancy is probably due to random variation and the warm-up time from the simulation start. But what has happened to waiting times? The above graph is a cumulative frequency graph. It reads as follows: The what-if value for 2 minutes is 0.29. This means that 29% of passengers wait less than 2 minutes. The as-is value for 5 minutes is 0.65. This means that 65% of passengers wait less than 5 minutes. Now we can see a huge difference! 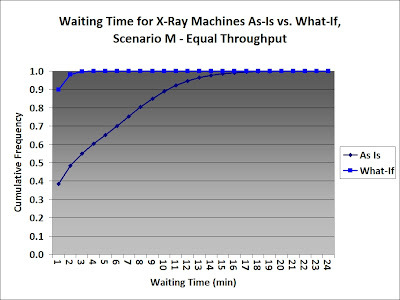 Not only does the new configuration outperform the old in terms of throughput, it is significantly better for customer waiting times. What about our slow and fast scenarios? We know from our bottle-neck analysis that throughput will not increase, but what will happen to waiting times? Above is a comparison between as-is and what-if for the fast scenario. The boarding pass checkers are fast compared to the x-ray machines, so in both cases the x-ray machines are nearly overwhelmed and the waiting time is long. Why do the curves cross? The passengers that are fortunate enough to pick a checker with two x-ray machines behind them will experience better waiting times due to the pooling and the others experience worse. This is a bit subtle, but an interesting result. In this scenario there is no throughput benefit from changing, there is no average waiting time benefit from changing, but waiting times are less variable. Finally, we can take a quick glance at our slow S scenario. 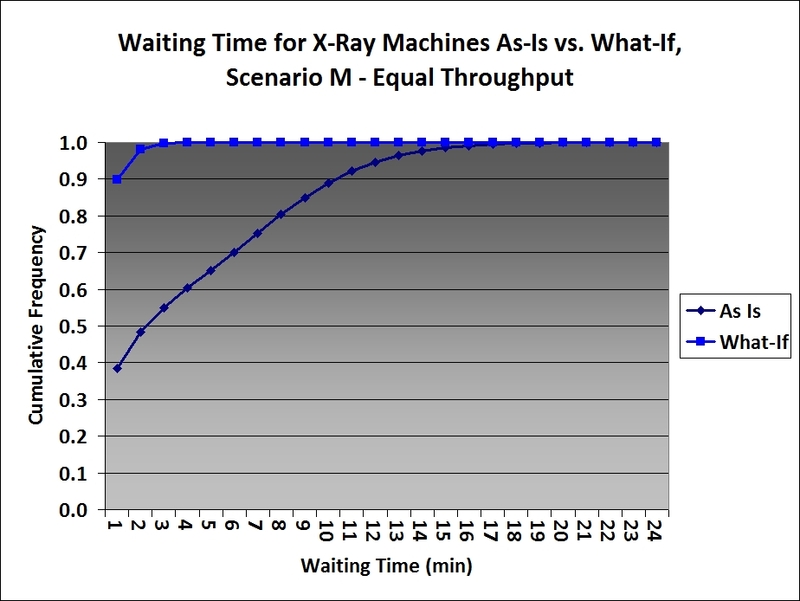 We know again from our bottleneck analysis that there is no benefit to be had in terms of throughput, but what about waiting times? Clearly a huge differenence. The slow checkers are able to provide plenty of customers for the single x-ray teams, but are unable to keep the double teams busy. If you're unlucky you end up in a queue for a single x-ray machine, but if you're luck you are served immediately by one of the double teams. To an Operations Research practitioner with experience doing discrete event simulation, this example will seem a bit Mickey Mouse. However, it's an excellent and easily accessible demonstration of the benefits one can realize with this tool. A manager whose bottleneck analysis has determined that no large throughput increase could be achieved with a reconfiguration might change their mind after seeing this analysis. The second order benefits, improved customer waiting times, are substantial. In order to build the model for this article in a professional setting you would probably require Arena Basic Edition Plus, as I used the advanced feature of output to file that is not available in Basic. Arena Basic goes for $1,895 USD. You could easily accomplish what we have done today with much cheaper products, but it is not simple examples like this that demonstrate the power of products like Arena. Earlier Dawen wrote an article about her recent experience in security screening at Gatwick Airport. I thought this was an opportunity to demonstrate a simple process analysis tool which could be considered a part of Operations Research: Bottleneck Analysis. At the airport, servers in the two-step security check process were un-pooled and thus dedicated to one another. By this, I mean that a security system with four staff checking boarding passes (step 1) and six teams at x-ray machines (step 2) were actually functioning as four separate units rather than as a team. Each unit had a boarding pass checker, two of the units had a single x-ray machine and the other two units had two x-ray machines. The consequence of this was that the one-to-one units overwhelmed their x-ray teams, forcing them to stop checking boarding passes and remaining idle. The one-to-two units were starved of passengers as the boarding pass checking could not keep up, resulting in idle x-ray machines. We know that this configuration is costing them capacity. A very interesting question is: How much? A Bottleneck Analysis is a simple tool for determining a system's maximum potential throughput. It says nothing about total processing time or the amount of passengers waiting in the system, but it does determine the rate at which screenings can be completed. Think of it as emptying a wine bottle upside down. Whether it's a half full bottle of molasses or a full bottle of wine, the maximum rate of flow is determined by the width of the neck (the bottleneck!). The maximum throughput rate of a system is equal to the throughput rate of its bottleneck. The throughput of the current system is the limited by the bottleneck in each unit, each sub-system. In the case of the one-to-one units we know this is the x-ray machine, as they are unable to keep up with supply from upstream and are thus limiting throughput. In the case of the one-to-two units we know it is the boarding pass checker as the x-ray machines are waiting idly for new passengers and are thus limited. It follows that the maximum throughput for the combined system is two times the throughput of a single boarding pass checker plus two times the throughput of a single x-ray machine. The natural reconfiguration that Dawen alludes to her in her article is one where the resources are pooled and the queues are merged. Rather than having two x-ray machines dedicated to a single boarding pass checker, passengers completing step 1 are directed to the x-ray machine with the shortest queue. In this way an x-ray machine is only idle if all four boarding pass checkers are incapable of supplying it a passenger and a boarding pass checker is only idle if all six x-ray machines are overwhelmed. What is the throughput of this reconfigured system? The throughput is equal to the bottleneck of the system. This is either the four boarding pass checkers as a team if they are incapable of keeping the x-rays busy or the x-ray machines as a group because they are unable to keep up with the checkers. The bottleneck and thus maximum throughput is either equal to four times the throughput of a boarding pass checker (step 1) or six times the throughput of an x-ray machine (step 2), whichever is smaller. Returning to the exam question, how much capacity is this miss-configuration costing them? At this point we need must resort to some mathematical notation or else words will get the better of us. Readers uninterested in the mathematics may want to skip to the conclusion. 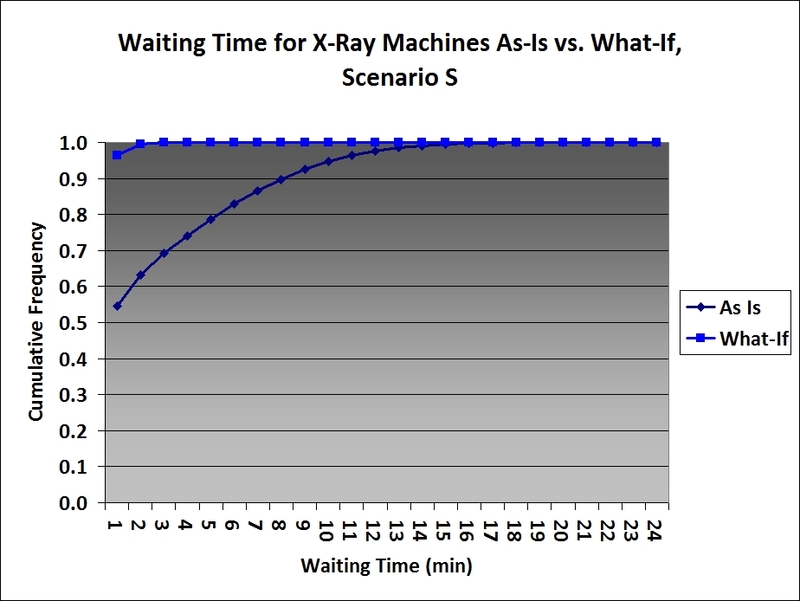 Let x be the throughput rate of an x-ray machine. Let b be the throughput rate of a boarding pass checker. 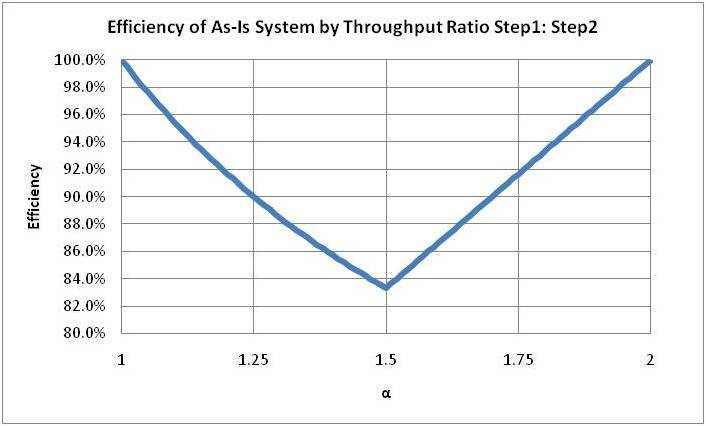 The maximum throughput of the as-is system is thus 2x + 2b (see earlier). If step 1 is the bottleneck in the reconfigured system then the max throughput is 4b. If step 2 is the bottleneck of the reconfigured system then the max throughput is 6x. If 4b <> 6x then step 2 is the bottleneck. If we were managers working for the British Airport Authority (BAA) at Gatwick Airport our work would essentially be done. We could simply drop in our known values for b and x and reach our conclusion. For this article, though, we don't have the luxury of access to that information. Returning to the exam question again, how can we determine what the cost of this miss-configuration is without knowing b or x? Let b = αx or equivalently b/x = α. If 4b <> 1.5 then the throughput of the new system is 6x. The throughput of the as-is system is 2b + 2x = 2 α x + 2x. 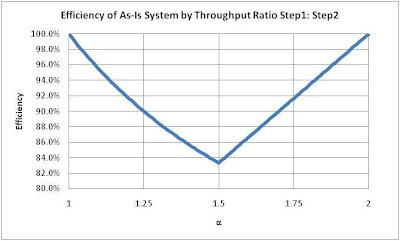 The fraction of realized potential capacity in the as-is system is the throughput of the as-is system divided by the potential throughput of the reconfigured system. What are the possible values of α? We know α is at least 1 because otherwise the x-ray machines in the one-to-one systems would not be overwhelmed by a more productive boarding pass checker. We know α is less than 2 or else the x-ray machines in the one-to-two systems would not have been idle. f(α) = 1/2 + 1/(2 α) where 1 <= α <= 1.5 f(α) = 1/3 + α /3 where 1.5 <= α <= 2 But what does this look like? If α is 1 or 2, then the as-is system is at peak efficiency. If α is 1.5 we are at our worst case scenario and efficiency is 83.3% of optimal. Based on the graph above, depending on the relative effectiveness of the boarding pass screeners and the x-ray machines (unknown), the system is running at between 83.3% and 100% efficiency. The most likely values is somewhere in the middle, so there is a very good chance that the configuration of the security system is costing them 10% of possible capacity. To rephrase that, a reconfiguration could increase capacity by as much as 20%, but probably around 11%. In the worst case a reconfiguration could allow for the reallocation of an entire x-ray team yielding significant savings. As stated previously, a bottleneck analysis will determine the maximum throughput rate, but it says nothing about the time to process a passenger or the number of passengers in the system at any one time. We now know that this miss-configuration is costing them about 10% capacity, but there are other costs currently hidden to us. What is the customer experience currently like and how could it improve? Is the current system causing unnecessary long waiting times for some unlucky customers? Definitely. More advanced methods like Queuing Theory and Simulation will be necessary to answer that question, both tools firmly in the toolbox of Operations Research practitioners.